Posted under Health Guides. Updated 22 January 2019. 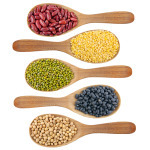 Foods such as beans, lentils, chickpeas, lupins, and peas are known as legumes. They are edible seeds grown in pods. Legumes are good sources of protein and fiber, and are used in many different cuisines. In the US, you can find fresh, canned, frozen, or dried versions of many legumes. What are some examples of common legumes?